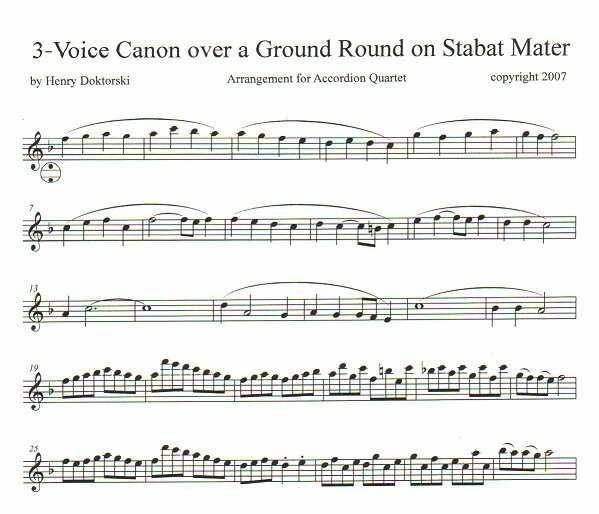 Printed Music: Three-Voice Canon over a Ground Round on “Stabat Mater,” by Henry Doktorski (2007). Duration: 5 minutes. Stabat Mater, one of the most powerful and immediate of extant medieval poems, meditates on the suffering of Mary during her son’s crucifixion, and is sung regularly today at Roman Catholic churches at Stations of the Cross during Lent. This hymn is also found in some Protestant hymnals. Stabat Mater has been set to music by many composers, among them Joseph Haydn, Antonín Dvorák, Antonio Vivaldi, Emanuele d’Astorga, Gioacchino Rossini, Giovanni Battista Pergolesi, Charles Villiers Stanford, Charles Gounod, Krzysztof Penderecki, Francis Poulenc, Karol Szymanowski, Alessandro Scarlatti, Pedro de Escobar, Arvo Pärt, and Giuseppe Verdi. Henry’s setting of Stabat Mater was composed as a canon for three voices, reminiscent of the famous Kanon in D by Johann Pachelbel, and recorded with an accordion quartet. He wrote this expressly for his Ave Maria: Hymns to Mary CD. His piece was performed in concert (in a version for contralto, oboe, violin and accordion) by mezzo-soprano Raquel Winnica Young and the Bell’Art Ensemble. Overseas customers, contact Henry for shipping rates.